Another month has come to an end, which means it's time to look at my monthly favourites. Let's see what I reached for the most during the month of August! We have something from every category - skin care, hair care, and body care! A toning, hydrating mist featuring a refreshing blend of rosehip, ylang ylang, resveratrol-rich grapeseed oil, and antioxidant-rich organic botanical juices for a fresh, radiant complexion. When I purchased this, I was on the hunt for a rose water mist. This makes my skin feel hydrated, and I use it after washing my face as a toner, after applying makeup, or just when I feel like my skin needs a boost of hydration. It feels great! This such a pretty blush! It's neutral but works for so many skin tones. It works with any type of eye or lip colour and lasts all day. It blends easily and doesn't just disappear on your face. This pan will last me forever, and it's only a travel size! I received this in my secret santa swap back in December, which probably sounds disgusting because I'm still using it. It's a little thicker than when I first received it, but I haven't had a bad reaction from it, so I will keep using it for now. 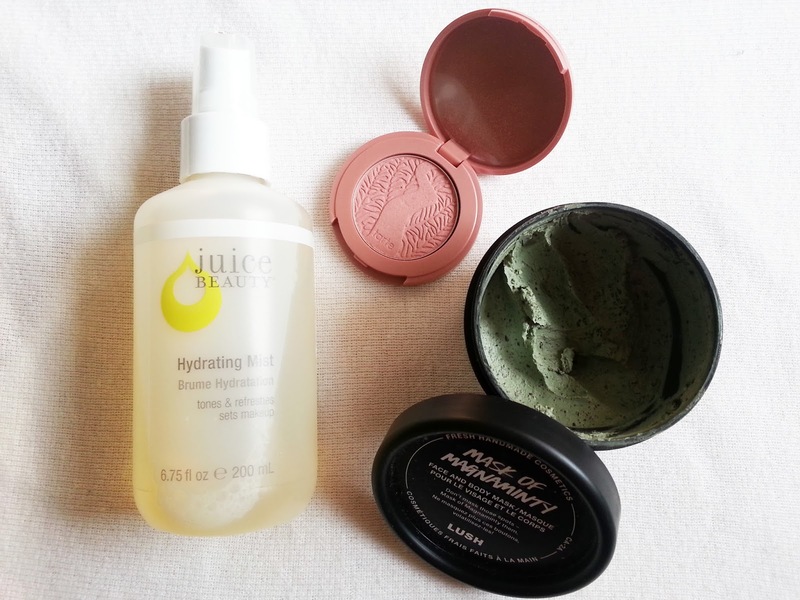 It gives just the right amount of exfoliation, and feels so cooling on the skin. Perfect for a relaxing night. I received this in a summer blogger box, which contained natural and organic skincare items made in Canada. I had never tried a natural deodorant when I received the box, so I had to put this to the test. 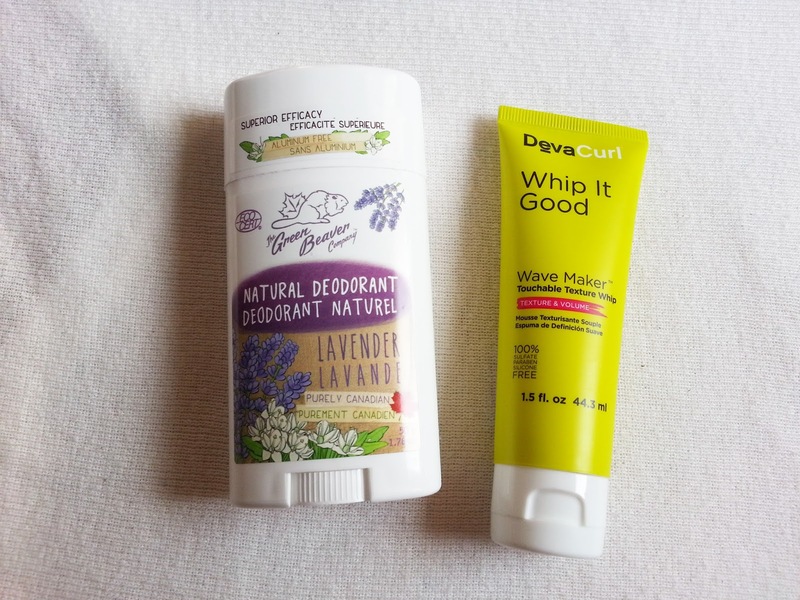 While I'm not the biggest lavender fan, this deodorant is great. It does go on clear, and immediately fights against sweat and scent. It doesn't feel sticky, and doesn't leave marks on your clothes. I'll definitely consider purchasing a different scent once this one runs out. Plus, it has no aluminum in the ingredients! I received this in the Sephora Favorites - Summer Hair Saviors kit and I've been loving it! Especially on those days I don't feel like using heat on my hair. This has a light, but creamy texture. I find it really does help enhance the waves/slight curl in my hair, without weighting my hair down. And it has a light scent of coconut, perfect! 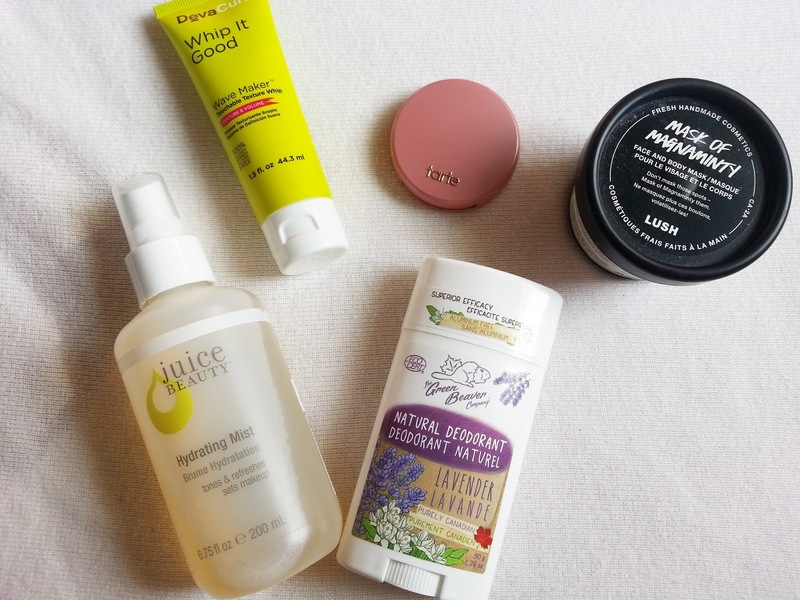 Have you tried any of my favourite products for the month? Which have you tried? !